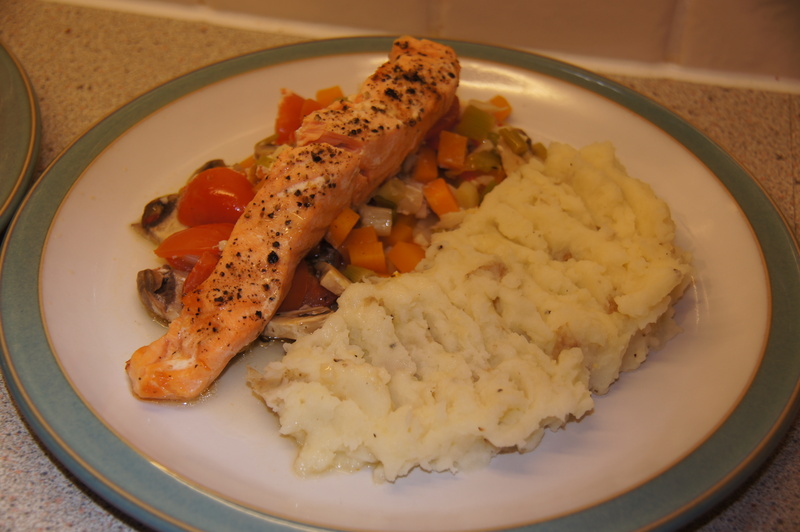 My favourite way to serve salmon, tasty salmon steamed on a bed of fresh vegetable and served with fluffy mash. I have served this recipe to numerous friends who claim they don’t like salmon but this dish always seems to change their minds. The recipe can be adapted a little to what you have in the fridge, as long as you keep the base of garlic, chilli, lemon and olive oil. Preheat the oven to 180°c and boil the kettle. Finely chop the chilli and the garlic, chop the potatoes and chop up the other vegetables into small pieces. Cut silver foil into two large pieces. Place a bed of the chopped chilli, garlic and vegetables onto the centre of the foil. Place the salmon on the bed of vegetables and drizzle in olive oil, lemon and season with salt and pepper. 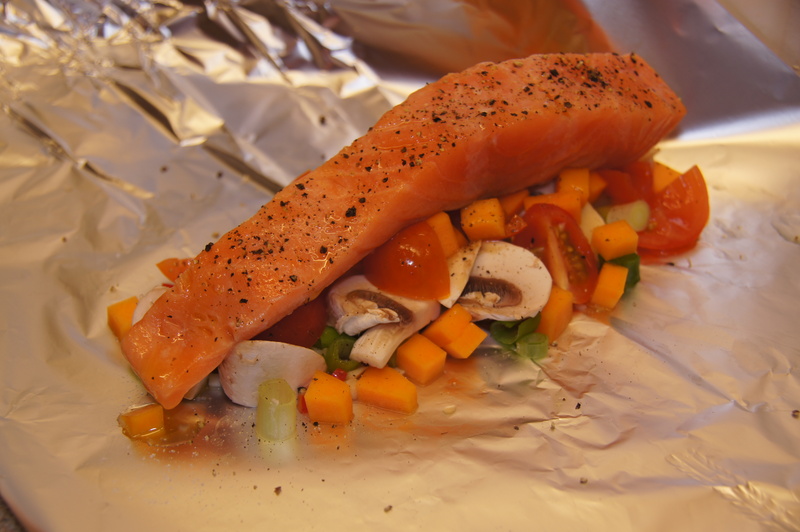 Fold up the two sides of the silver foil, seal and places parcels on a baking tray and pop into the oven for 15 minutes. Whilst the salmon is cooking place the chopped potatoes into a pan and put on for boiling, once soft, drain and mash with butter and milk or dairy free alternative and season well. Plate up the mash and then place the salmon and vegetable on once cooked. This entry was posted in Dinner and tagged butternut squash, chilli, dairyfree, garlic, glutenfree, lemon, mash, mushroom, olive oil, parcels, potato, salmon, spring onion, tomato. Bookmark the permalink.